A quick masculine card, these seem to come easy to me and it helps that I enjoy putting them together. 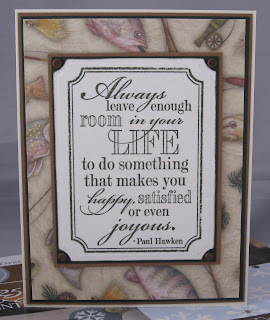 Supplies: Brown, green and cream cardstock, Designer Paper – Great Outdoors Earthtones, Stampers Anoymous – Teresa Collins Family quote, Spellbinders Small Labels Nestabilites, misc brads. On another note curious minds want to know some of my favorite tools, I am not very handy with a cutting knife so I have an assortment scissors. The first are what my local stamp store calls Elle scissors, but I believe they are Elizabeth Craft Designs Spring Scissors. They are amazing for those itty bitty small almost need a knife places. The Fiscars Softtouch are my all round favorite pair, they can do everything from precise cutting to a smooth cut on ribbon. My next pair are a close backup to the ones above and all are within close reach. 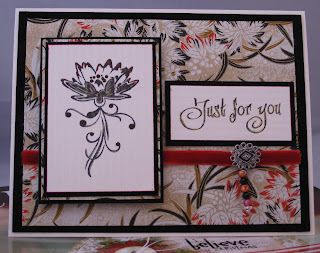 Last but not least my big guns Stampin' Up! Craft and rubber scissors. I brought these to cut out my Stampin' Up stamps but they are workhorses for me. This is not the best picture of them. I do love layers on my cards. This beautiful flower was not very easy to cut out but in the end it was well worth it for the 2d effect. The blooms are all glossed up with Diamond Glaze and flower is popped up with foam adhesive tape. I really like to use Scotch mounting tape, I can cut it any length or thickness so that I could put it in behind the flower stems. In the inside I stamped Happy Birthday. 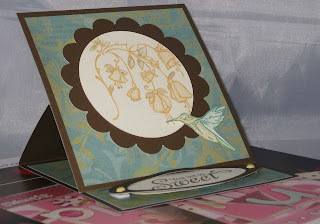 Supplies: Cream and brown cardstock, Hot off the Press Vintage Designer Paper, The Artful Stamper – Elegant Orchid, Close to my Heart – Ribbon Round Chocolate Collection and cream pearls, Versafine-Olympia Green, Dew Drop – Crimson Copper, Judikins-Diamond glaze, Scotch mounting tape. I was drawn to this stamp, I have tried to make a card in the past with it but I ended up putting it to the side and not getting it finished. This one just flowed. I wanted the whole card to be two toned, black and browns, where there is black cardstock there is brown ink and black ink with the brown cardstock. Overall a little bit of a different look but interesting. Supplies: Cream, black and brown cardstock, Hot off the Press Masculine Designer paper, Magenta Crafty Individuals – Negative Landscape, misc square brads. I watched a video on Stamp TV by Gina K on how to make an image appear as if behind cracked glass. This inspired me to give it a try. 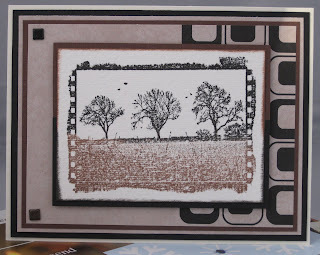 I don't have Ultra thick embossing power so I made due with what I had, which is deep impression embossing powder. I need to coat the image 3 times to get it think enough. I am currently in love with my Versamark Dazzle so I though I would use that instead of regular Versamark. The first image does not really show the glossy glass like effect but it does show the cracks. This image where I used the flash , does show all the extra little sparkes that show up by using the Versamark Dazzle. I guess this does take a little away from the vintage look with all those sparkles but I don't care. Take a look at Stamp TV for all sorts of interesting ideas. 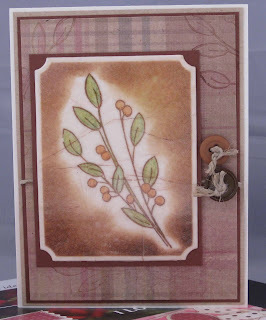 Supplies: Cream and brown cardstock, Designer paper - My Mind's Eye - Life Stories, Great Impressions- Berry Branch, Spellbinders Nestabilites, Stamp Stuff - Deep Impressions Embossing powder, misc twine, misc Sisters's buttons. This is another cute idea from my last Close to my Heart workshop. 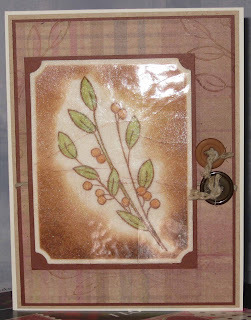 This card is called an Easel Card, both this card and the card posted previously are made from instructions found on SplitcoastStampers. I took this picture at an angle in hopes to catch how it us held open by the sentiments section that is popped up with popdots. The humingbird is also on popdots. 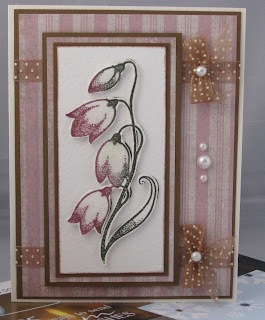 We used shadow stamping for the flower. The wonderful thing I like about both of the designs we made at this workshop is they fold down and use in a 4 3/8 x 5 3/4 (invitation)envelopes. 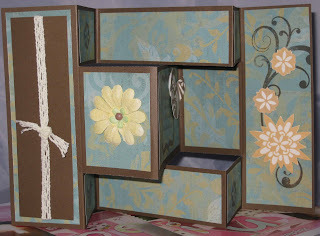 The last Clost to my Heart workshop we make two very interesting cards, the first is a Tri-fold shutter card. I wanted to try masking with my Spellbinders with this card. I like the way it turned out. The inside has a small insert with Thanks on it. I felt if I colored the whole stamped image it might overwhelm the card. I love my bow easy, it allows me to make the cutest bows. 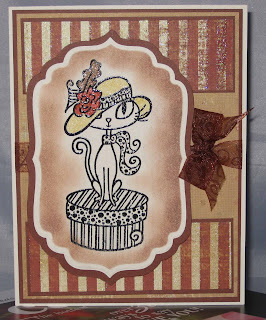 Supplies: Cream cardstock, Designer Paper-My Mind's Eye, Pink Cat Studios- Cat, Spellbinders nestabilities, misc ribbon. 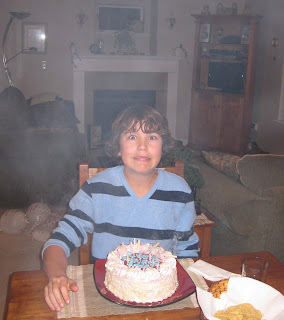 My little boy is 16, I guess I cannot call him that anymore or even my little man. I don’t care how old I am on my birthday but when it is my son’s birthday that seem to make me feel just that little bit older. I think this will be the last time we try to fill the cake with the multitude of candles that he now requires. I was waiting for the fire department to smell all that smoke. I was lucky enough at Christmas to be given and wonderful Michael’s gift card, which combines with many 40% coupons I started acquiring a collection of Adirondack Alcohol Inks. My first project was trying to make some backgrounds. 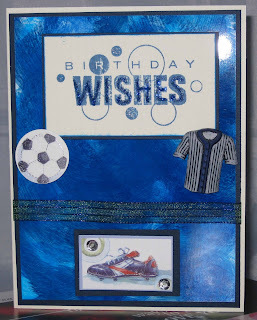 My son likes soccer and he is dedicated to it right now, so I though the theme for his Birthday card should reflect that. Supplies: Cream cardstock, glossy paper, Adirondack Alcohol Inks, Inkadinado- Birthday wishes, Jolee Dress it up button, Misc dollar store stickers. Happy New Year and welcome to 2010, I have been dragging my blogging heals. I have not been overly creative since making my Christmas cards. I wonder if I just wore out my little creative being for a bit. I am plugging away at some cards and hope to get them posted in the next week or so though. I have not been doing much in the way of blog rounds either, I know there have been a lot of crafty people being busy but I apologize I have not been visiting. I hope to get a little of that done soon too. This was a quick card I did before Christmas, I was so excited to make a card with this new Japanese paper I picked up at the local stamp store. I had also been to a demo at Michaels for a book mark that is just so cute, the beads on this card are similar to what was at the top of the bookmark. I wanted to see if I could make it work on the card, that jury is still out on what I think about the beads. The little metal piece could pass for a brad but is actually makings for jewelry I found at Michaels. I love the Japanese paper and coupled with the suede like designer paper I purchased from Paperwishes I was happy with the end result. Supplies: Cream cardstock, black suede Designer paper, Japanese designer paper, Inkadinkado-Lotus Flower, misc-Just for you, misc beads and fashion accessory, red velvet ribbon.